ALBANY, NY (WSKG) – A government reform group has filed a lawsuit to stop a pay raise granted to state lawmakers by a compensation commission. The conservative leaning Government Justice Center, says the salary increase is unconstitutional, because it also “radically change the rules surrounding serving in the state Legislature”. The group filed papers in State Supreme Court in Albany on Friday morning. Some lawmakers are also angry over the commission’s recommended restrictions on their outside income and stipends. When the pay commission on December 10th recommended gradually increasing legislators’ annual salaries from the current $79,500 a year to $130,000 a year by 2021, it also said that Senators and Assembly members would have to restrict outside income earned to 15% of their total salary. It also eliminated dozens of stipends for leadership posts and committee chairs be eliminated. The strings attached to the pay hike have raised concern among some lawmakers. Around one third of the members of the legislature hold other jobs, and many benefit from the over 150 stipends that are now distributed for various posts. Assembly Speaker Carl Heastie, following a closed door meeting with Democratic majority members, says he’s not necessarily against restricting outside income or perhaps cutting down on the number of stipends. But he says he believes the commission overstepped its authority by trying to mandate what the legislature, a separate branch of government can do. 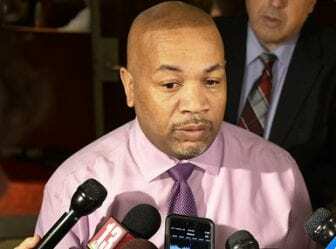 “It may have put this entire pay raise in jeopardy,” said Heastie. The commission was created as part of the state budget agreement in late March. It’s members are the New York State and City comptrollers, Tom DiNapoli and Scott Stringer the board chairs of the State and New York City university systems, Carl McCall and William Thompson, who also happen to be former state and city comptrollers. Under the statute setting up the commission, it is permitted to set “performance standards” that lawmakers must meet in order to receive the second and third phases of the salary increases. And it can also make those phases contingent on the Senate and the Assembly passing the state budget by the April 1 deadline. The commission also agreed to raise the pay of the governor from $179,500 to $250,000 over the three year period. But it did not place outside income restrictions on the governor or any of the state commissioners who would also get a raise. Speaker Heastie says that’s a concern. “For some reason they decided to only put these stipulations on the legislature and not the governor,” Heastie said. John McDonald is an Assemblyman ,but he also owns a pharmacy in Cohoes, near Albany. He says it’s unfair to ask him to give up his salary for running a business that’s been in his family for decades. McDonald says he’s not going to give up his business or his job there. “The people in the City of Cohoes, and the people of the 108th Assembly district have now elected me to office eight times knowing full well what I do for a living,” McDonald said. Assemblywoman Crystal Peoples- Stokes, who does not earn any money outside of her legislative post, plus a stipend for being Chair of the Assembly’s Committee on Governmental Operation, is also wary of imposing limits on outside income. The Assembly Democrats have not yet decided whether to hold a special session by the end of the year to override the commission and enact a pay raise without any additional requirements attached , or whether to try to make changes to the commission’s recommendations on outside income and stipends next year. Democrats in the Senate, who will be in the majority in January, have said they agree with the income restrictions. But Republicans, who hold the majority through December 31st, have also expressed concerns. Senate GOP Leader John Flanagan said in a statement that he also believes the commission misused its powers and that the limits on stipends and outside income are “an inherent conflict of interest that runs contrary to the separation of powers” between the Executive branch and the Legislature. Flanagan did not say whether he wants to return to the Capitol before the new year begins to make any changes.